At the Northern Virginia Urban League’s Annual Awards, Dr. Clayton G. Lawrence reaffirms his ongoing commitment to mentor young African-American males. Washington, DC, April 08, 2014 --(PR.com)-- The Northern Virginia Urban League (NVUL) hosted its 24th Annual Community Service and Scholarship Awards Dinner on April 4th. The dinner was hosted to honor outstanding military service men and women, as well as to award educational scholarships to local youth that have demonstrated academic excellence in their schools. In partnering with community non-profit organizations to carry out the event each year, NVUL invited LEAP Foundation DC to support this year’s event, and Dr. Clayton Lawrence, CEO and founder of the organization, was delighted to accept. Outside of supporting the event by providing the Dr. Clayton G. Lawrence Endowment for Academic Excellence Scholarship to Daniel Brown who will be attending Stanford University in the fall, Lawrence also utilized the event to facilitate another mentorship opportunity. In mid-March, young, African-American male students were given the opportunity to submit essays to be considered for an invitation to the NVUL dinner. An invitation to the dinner would secure the young men a spot at Dr. Lawrence’s table for the event, as well as entrance into a new mentorship program for young men interested in pursuing military careers. The night was a prestigious event with many top honorees and local leaders in attendance. The recipient of the Dr. Clayton G. Lawrence Endowment for Academic Excellence Scholarship, Daniel J. Brown (featured at the top of the photo), has maintained a 4.0 GPA at Wakefield High School. To accompany Dr. Lawrence in presenting this award was the NVUL Chair of the Board of Directors, Angela Moody, and NVUL President and CEO, Cynthia Dinkins (bottom left hand photo). 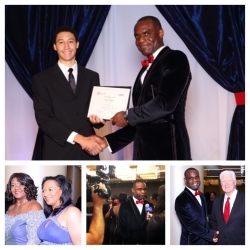 Preceding the event, Dr. Lawrence conducted an interview with Comcast where he stated that LEAP would remain dedicated to NVUL’s mission to empower every American child to be ready for college, work, and life (bottom center photo). Dr. Lawrence was also greeted by the Honorable James P. Moran of the U.S. House of Representatives for Virginia’s 8th District (bottom right hand photo). This mentorship opportunity will not be the first of its kind that Dr. Lawrence has partnered to support. He has been instrumental in his past invitations to join Congresswoman Eleanor Holmes Norton’s initiative, the Black Men and Boys Commission, designed to place young men on the road to lucrative employment opportunities. As he continues to find ways to open doors for young men coming from similar backgrounds as himself, he realizes just how significant these opportunities are and the profound influence that they can make in young lives.